Are you looking to practice yoga and meditation in the heart of Himalayas so that it has a strong impression in your mind and soul? Then you should definitely come down to Retreat in Himalayas, the number one Himalayas yoga and meditation retreat that can offer you flexible programs for all your spiritual and physical health needs. For many years, Retreat in Himalayas has served as one of the finest holiday yoga retreats in this part of the world, welcoming both Indians and foreigners alike. The unique thing about them is that they offer a great combination of yoga and meditation with adventure activities that will keep you completely engrossed in the experience. 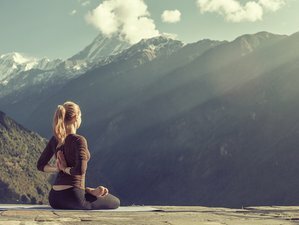 Signing up for a yoga and meditation program in Retreat in Himalayas can open up many doors for you as you can interact with some of the most eminent yoga and meditation teachers in India. These teachers have many years of experience in their line of work and can gently guide you when you are looking to master the core and advanced aspects of yoga and meditation. You can also be a part of an adventure and trekking program in the Himalayas that can take you through the wilderness of the mountains and valleys of this region. Yoga Retreat in Himalayas offers guests a tranquil, rejuvenating, home away from home experience. The room has its own bathroom and a porch overlooking the jungle. The bedroom has a spacious and comfortable bed. Yoga Retreat in Himalayas has both private and twin shared accommodation. Morning wakes up at 6;00 a.m and after that from 7:00 to 8:30 a.m you will practice an asana class. At 9:00 a.m., enjoy breakfast, after which you will be taken for a walking tour in Rishikesh local market where you can see the colorful Indian culture, delicious Indian food, spices, clothes, ashrams, temples, and much more. Students will have lunch in the ashram at 2:30 p.m. All students will then go for a world-class Ganga ceremony in Parmarth Niketan in Rishikesh. After return back from the ceremony, enjoy your delicious dinner at 7:00 p.m. In the morning, after the yoga class, have your delicious breakfast in Rishikesh and then transfer to Devprayag. Devprayag is regarded as the most complete showcase of legends, tradition, and society. Here, the Bhagirathi from Gaumukh and the Alaknanda from Satopanth join and are named the River Ganges. In the morning, after the yoga class, enjoy your breakfast in Devprayag and then transfer to Khirsu which is 60 kilometers from Devprayag. The snow-laden mountains of Khirsu tempt the tourist during winters, while the panoramic view of the Central Himalayas attracts tourists during summers, where one can get a clear view of 300 named and unnamed peaks. Different types of birds species can be seen in the valley of the mighty Himalayas. In the morning, after the yoga class, have your delicious breakfast in Khirsu and then drive to Kandoliya Temple base. From here you have to walk approximately 500 meters to reach the temple which is located on the top hill in Pauri. Kandoliya Temple looks like as giving protection to the Pauri town. From the temple premises, one can witness a panoramic view of the Pauri market area and hills with snow-capped mountains. The temple is surrounded by a pine forest. One can see the scenic Gagwarsuin valley and Asia's highest sports ground at some distance from Kandoliya Temple. In the afternoon after having lunch drive back to hotel at Khirsu. Evening 6:00 p.m to 7:00 p.m meditation class and then dinner at 7:30 p.m.Overnight stay at hotel. In the morning, after the yoga class, have your breakfast and board the vehicle and drive back to Rishikesh. Enroute, you will have lunch and will reach Rishikesh in the late afternoon. Enjoy your meditation class in the evening. Overnight stay and dinner will be in Rishikesh. In the morning, after your delicious breakfast, this blissful retreat is finished with life-changing memories. Departure time is at 12:00 p.m. This retreat takes place at Himalayan Region of India. It is a Retreat full of natural aliveness that is absolutely unique for yoga and meditation retreats. It is where you live by the river, mountain, trees, birds, and lovable animals. It is where you can also enjoy sports and adventure activities. It inspires you to transform from the imaginary to the realistic world of yoga and meditation. It is where you will feel that your routine life converts into the natural life. The best and most convenient way to travel to Rishikesh is to take flight from Indira Gandhi International Airport (DEL) to Dehradun Airport (DED) as it is inexpensive compared to taxi fees and the duration is also shorter. Dehradun airport is merely 15 kilometres from the Retreat Centre. As soon as you book your flight, forward your flight details and we will send our driver to welcome you at Dehradun airport.